Twiga the giraffe and her friends are surprised - all of their brown spots have disappeared and been replaced by spots of various colors and shapes. Is it the mysterious spot disease? Each player has 4 giraffe cards representing the various parts of its body. 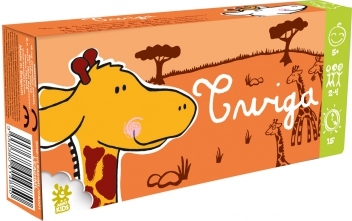 By drawing wooden shapes from a bag, help the giraffe find its real spots - they appear thanks to magic transparent cards. The first player to recover all of their giraffe's spots wins the game! A game of recognition, dexterity and speed. This little game makes spots appear just like magic through an original process.